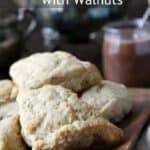 Mini Scones, with Walnuts, an easy breakfast, brunch, or snack recipe! Preheat oven to 375 degrees F. Line a large baking sheet(s) with parchment paper. Mix the flour, sugar, baking powder, and salt in a large mixing bowl. Cut in the cold butter cubes with 2 knives or a pastry cutter. In a separate bowl combine the heavy cream, egg, and vanilla then mix into the dry ingredients. Mix in the toasted walnuts. Roll the dough to about 1/2 inch thickness and cut into 2 1/2 inch squares with a square cookie cutter. With a sharp knife cut each square in half into triangles. Place scones on prepared baking sheet(s). Brush with additional heavy cream and sprinkle with sugar as desired. Bake scones at 375 degrees F for about 14-16 minutes or until golden brown. SNAPPY TIPS: Be sure the butter is cold and cubed before adding. Also be sure your toasted walnuts are cool before adding. A little orange zest in the batter would be a nice addition. SNAPPY SUBSTITUTIONS: You could substitute pecans for walnuts or omit the nuts.